Planning your DIY wedding decorations can give you so much pleasure. 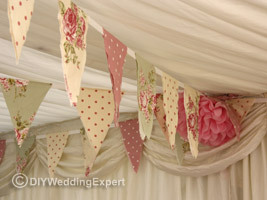 If you are a creative person you can quite simply embrace the whole DIY experience and pretty much make all your wedding decorations from the bunting to table cloths, creating original lighting and even decorate outside areas. However if you’re not as confident with a sewing machine and scissors don’t worry there are plenty of DIY wedding decorations that you can create with a little help. 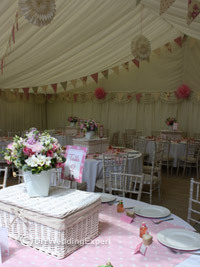 Adding bunting, color coordinated tablecloths and lanterns are an effective way to decorate your wedding venue. The great thing about all these DIY wedding decorations is they are not going to break the bank. You can easily make bunting from remnant pieces of fabric and believe me they are the easiest things to make and look so effective. Above you can see one of the recent weddings I’ve been working on. I love the soft pastel pink, cream and green colors for this vintage themed wedding. The reason this all works so well is all the diy wedding decorations are color coordinated right down to the wedding centerpieces and even the cushions and furnishings in the relaxing areas. If you don’t want to be involved with fabric and sewing then you might like to work with the candy. A great DIY wedding decorations project is to create a candy bar. These are just so popular right now and I’m not surprised, they are just so much fun. I love choosing the sweets to fit with the wedding color theme or by favorite candy memories from your childhood. 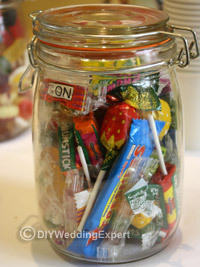 You can see in the photos above how the candy has been placed in kilner jars, you can also place them in glass vases. 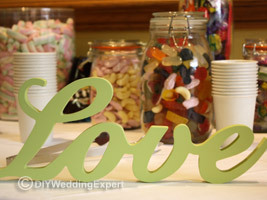 They make a great wedding decoration as you can have fun theming the table with color coordinated candy bags. You can even make personalized labels for the bags and jars with your names and wedding dates. 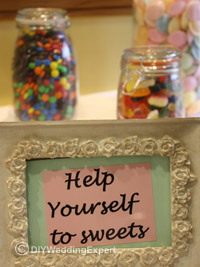 The candy bar gives guests somewhere to congregate and chat as they dip in and out of your tasty treats. 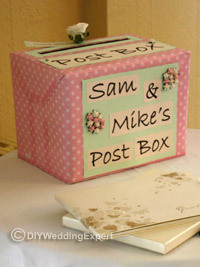 I’ve seen some wonderful card posting boxes that couples have made to coordinate with their wedding color theme. Not only do they provide you with yet another pretty DIY wedding decoration they are also a practical item. After all you wouldn’t want to loose any of your precious cards and messages and believe me you will have no chance of opening them on the wedding day. You can safely take them home to open at your leisure after your big day. 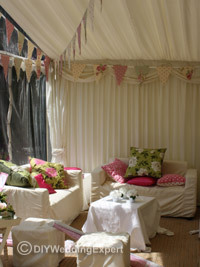 Don’t forget to think about the outside areas when you’re planning your DIY wedding decorations. You can add an extra bit of style to paths leading to the venue and outside areas that will be used to relax in the evening sun. You can also use archways and trees to mark the entrances. 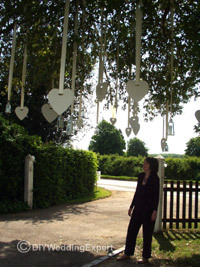 I love this idea here (see photo left) as I drove up to this wedding I was greeted by these wonderful large white wooden hearts hanging on wide satin ribbons from the branches of the trees. There were also some candle lanterns hanging that were going to be lit in the evening. It made such a pretty decoration to greet the wedding guests. Paper luminaries lining a walk way or path are also another great way to greet your evening wedding guests. Fill the bottom with sand so then they won’t blow away in the breeze. I also loved this children’s play area (photo above right), it was so tastefully decorated that it became another feature of the wedding rather that just being for the kids. 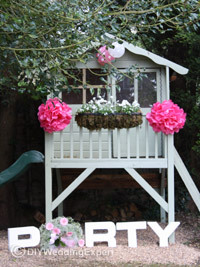 You can check out my do it yourself wedding decoration projects. I hope that gives you a few ideas that inspire you when you’re planning your own unique DIY wedding decorations.